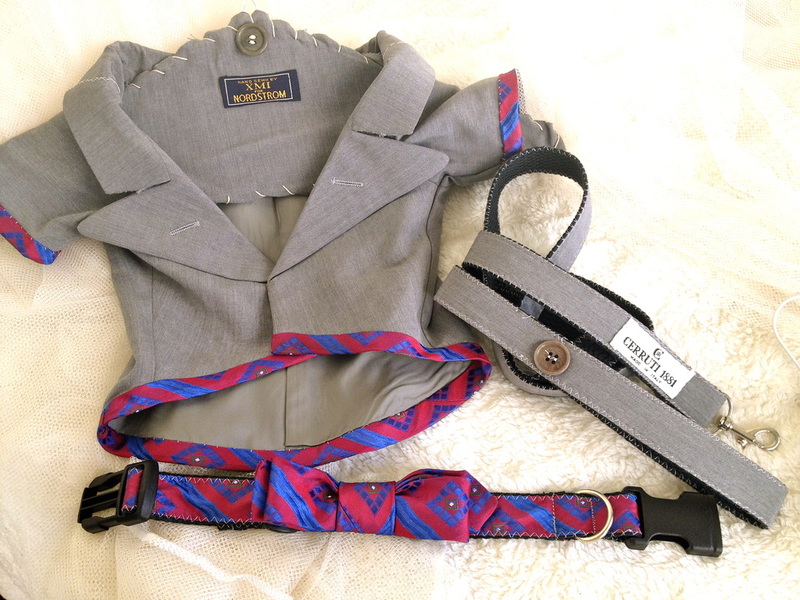 One of a kind designer collar and leash set. Does your dog deserve the softest place to lay their head while they look adoringly into your eyes? YES!!!! This blanket was made by deconstructing cashmere sweaters and piecing them into a blanket just for your best friend. It is one of a kind. Some other fibers include angora, wool, cotton and hemp. 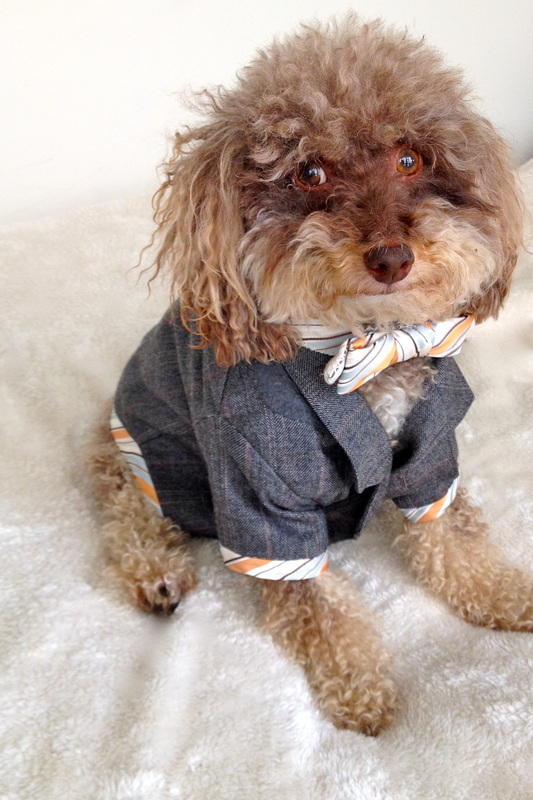 Description: This suit set was made out of a suit and tie that were sourced in Hollywood California and upcycled into everything that a dog that means business could possibly need for his wardrobe. 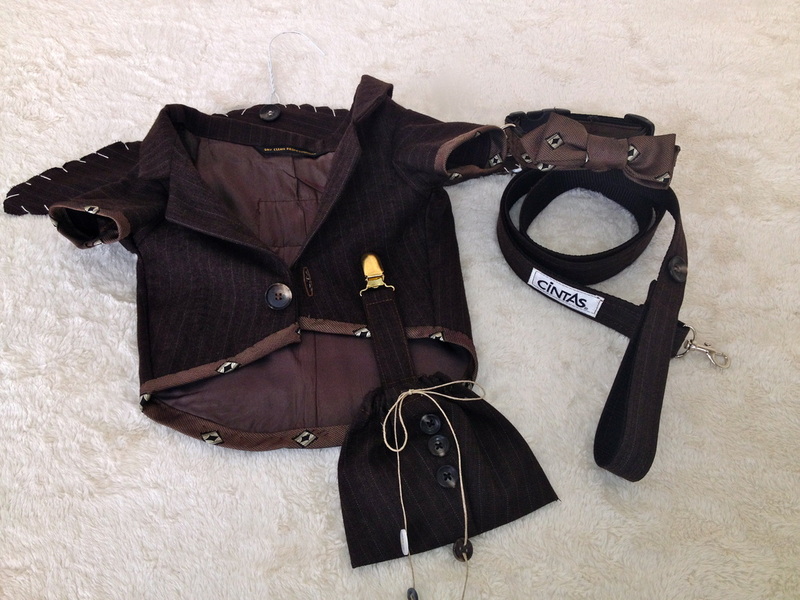 The jacket was deconstructed and hand stitched back together to fit a small dog (body length 8”-14”, chest 15”-18”, weight 7-15 lbs). The tie was cut up and made into a bow tie and seam binding which was stitched onto the hem of the sleeves and jacket. The hanger was upcycled from a left over dry cleaner hanger and scraps from the suit. All sets are one of a kind and include designer jacket, bow tie collar, leash, accessory bag and matching hanger. Suit: Made by Academy Award Clothes in Los Angeles, California. 100% lightweight wool, wide faint pinstripe, dark grey and blue. Tie: 100% imported silk from Nino Cerrito. was cut up and made into a bow tie and seam binding which was stitched onto the hem of the sleeves and jacket. The hanger was upcycled from a left over dry cleaner hanger and scraps from the suit. 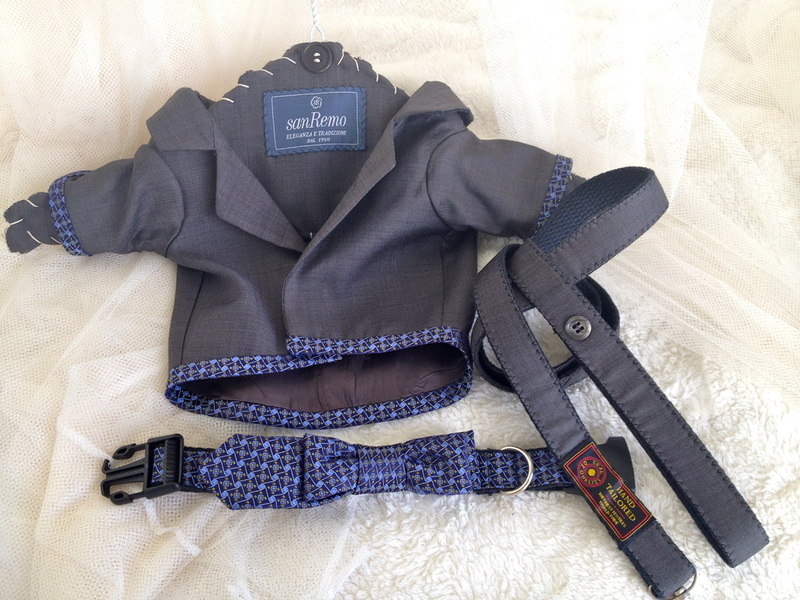 All sets are one of a kind and include designer jacket, bow tie collar, leash, accessory bag and matching hanger. weight wool black & white check. fit a small dog (body length 8”-14”, chest 15”-18”, weight 7-15 lbs). The tie was cut up and made into a bow tie and seam binding which was stitched onto the hem of the sleeves and jacket. The hanger was upcycled from a left over dry cleaner hanger and scraps from the suit. All sets are one of a kind and include designer jacket, bow tie collar, leash, accessory bag and matching hanger. dark grey and light blue. Tie: 100% imported silk from Proto-Uomo. and hand stitched back together to fit a small dog body length 8 to 14 inches, chest 15 to 18 inches, weight 7 to 15 pounds. The tie was cut up and made into a bow tie and seam binding which was stitched onto the hem of the sleeves and jacket. The hanger was upcycled from a left over dry cleaner hanger and scraps from the suit. All sets are one of a kind and include designer jacket, bow tie collar, leash, accessory bag and matching hanger. 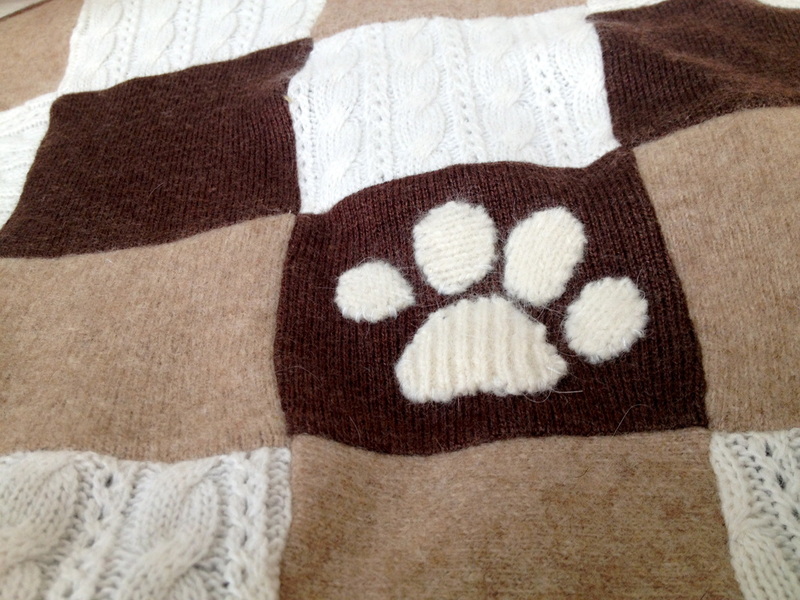 and hand stitched back together to fit an X small dog body length 6 - 8 inches, chest 8 to 10 inches, weight 4 to 8 pounds. The tie was cut up and made into a bow tie and seam binding which was stitched onto the hem of the sleeves and jacket. The hanger was upcycled from a left over dry cleaner hanger and scraps from the suit. 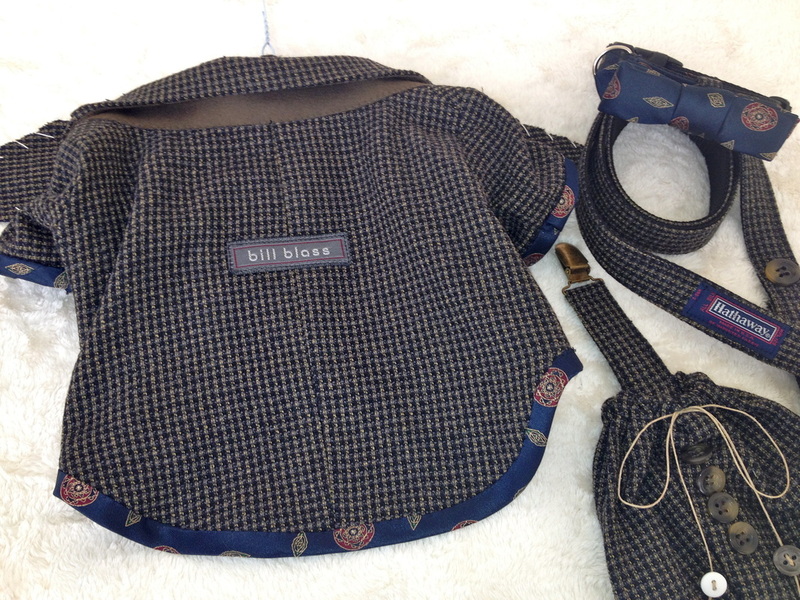 All sets are one of a kind and include designer jacket, bow tie collar, leash, accessory bag and matching hanger. and hand stitched back together to fit a small dog body length 8 to 14 inches, chest 15 to 18 inches, weight 7 to 15 pounds. The tie was cut up and made into a bow tie and seam binding which was stitchedonto the hem of the sleeves and jacket. 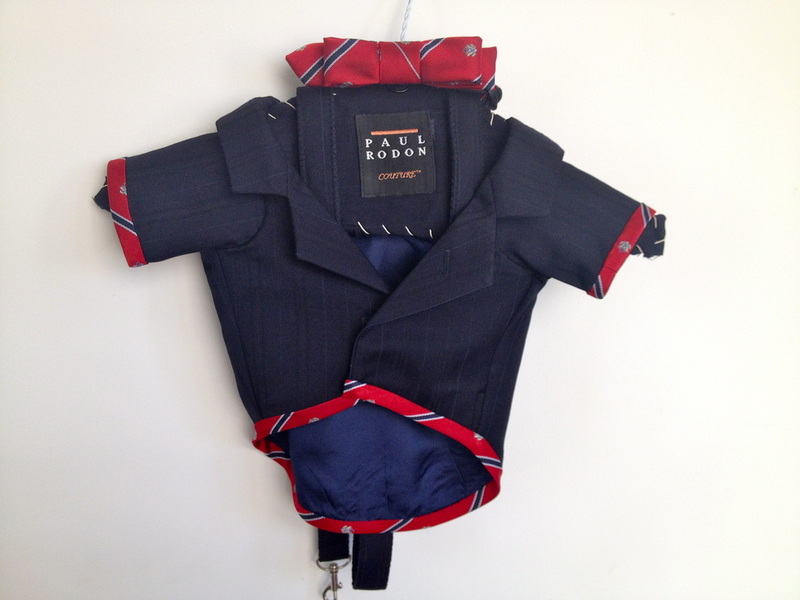 The hanger was upcycled from a left over dry cleaner hanger and scraps from the suit. All sets are one of a kind and include designer jacket, bow tie collar, leash, accessory bag and matching hanger. weight wool Golf Master’s Green. weight wool tan and blue pinstripe. and scraps from the suit. 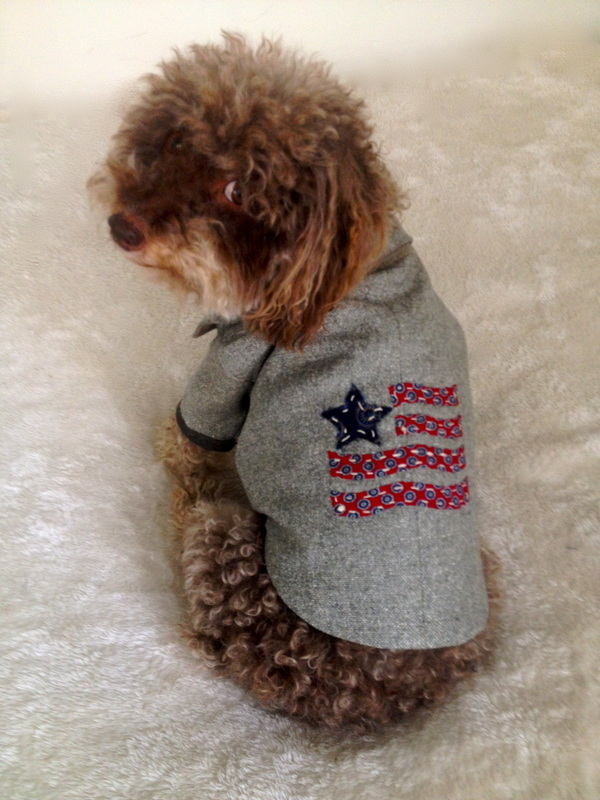 All sets are one of a kind and include designer jacket, bow tie collar, leash, accessory bag and matching hanger. from the suit. All sets are one of a kind and include designer jacket, bow tie collar, leash, accessory bag and matching hanger. Suit: Made by the Wall Street Collection. 100% lightweight grey wool tweed. Tie: 100% silk from Kenneth Cole. light-weight wool in light grey. 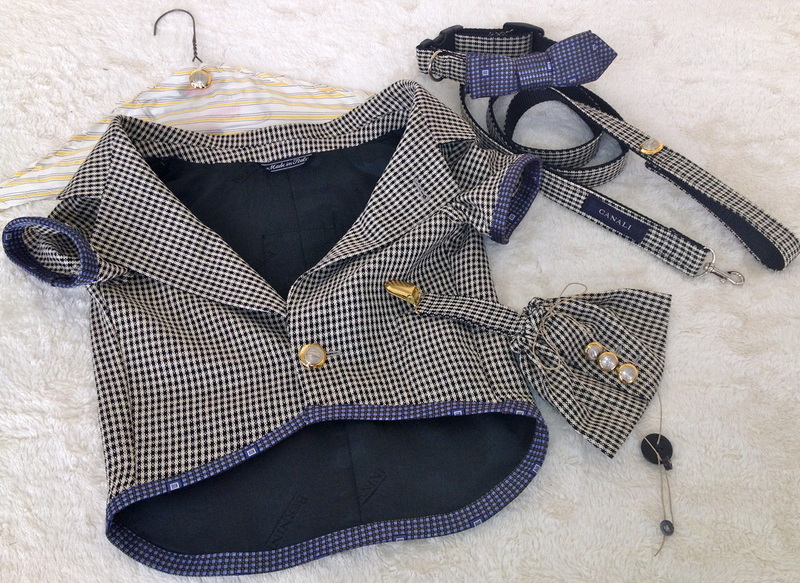 Bernini Beverly Hills 100% wool black & white HOUNDStooth with 100% imported silk tie from Canali upcycled into a medium dog (body length 12”-14”, chest 19”-23”, weight 10-31 lbs) suit set including jacket, leash, bow tie collar, and accessory bag. 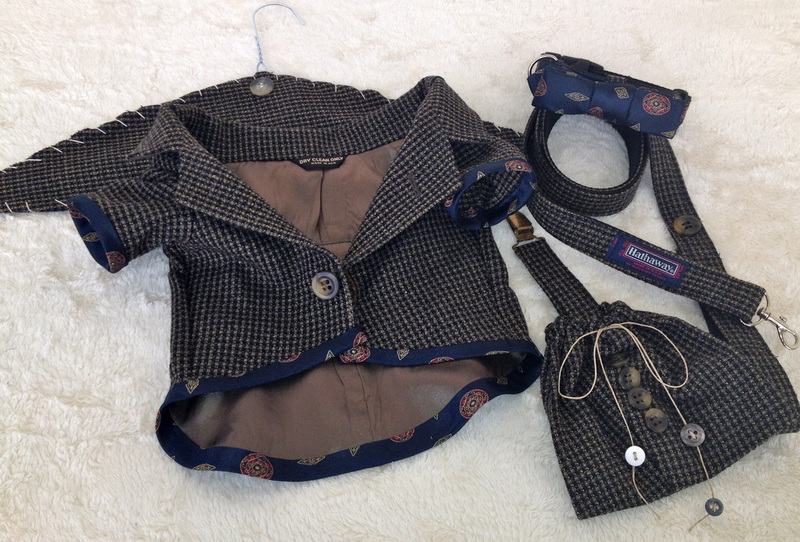 Carroll and Company 100% light-weight wool light brown plaid suit with 100% imported silk tie from Caltes Italy upcycled into a small dog (body length 8”-14”, chest 15”-18”, weight 7-15 lbs) suit set including jacket, leash, bow tie collar, and accessory bag. 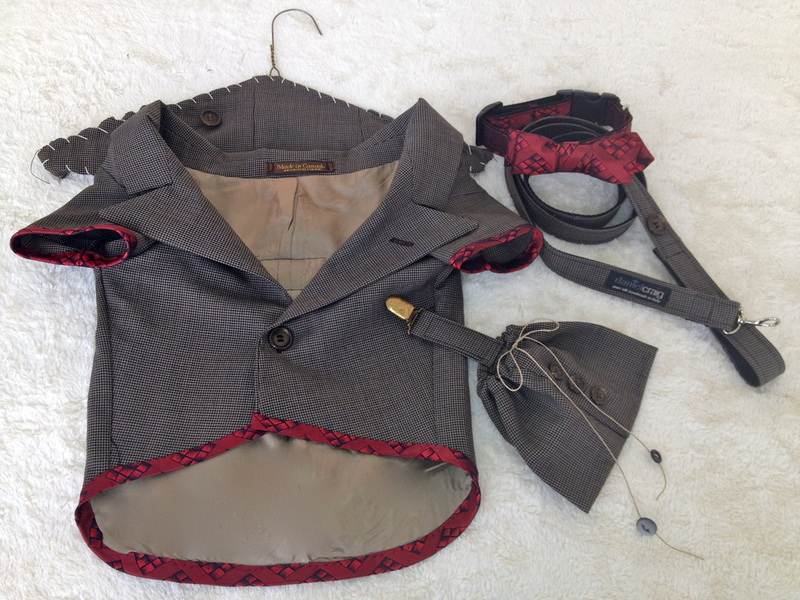 Enrico Corsini 100% lightweight wool black & brown mini HOUNDStooth with 100% imported silk tie from danielcraig Italy upcycled into a medium dog (body length 12”-14”, chest 19”-23”, weight 10-31 lbs) suit set including jacket, leash, bow tie collar, and accessory bag. 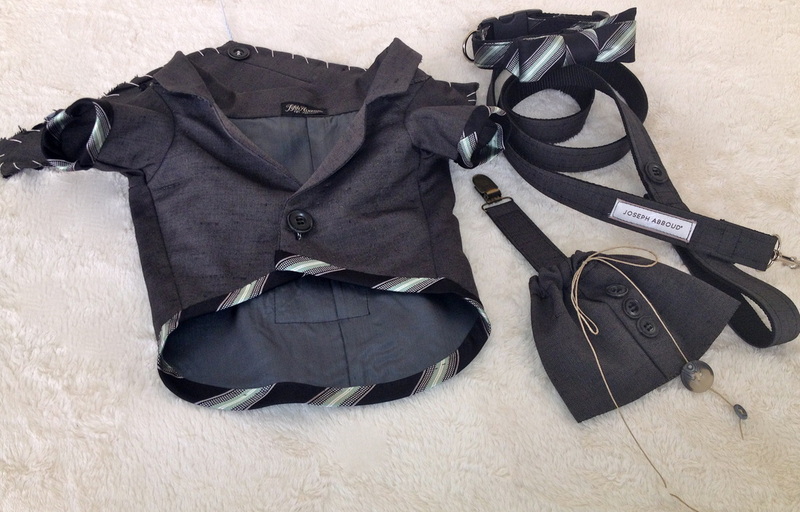 Fifth Avenue 100% light-weight linen suit in medium grey with 100% imported silk tie from Joseph Abboud upcycled into a small dog (body length 8”-14”, chest 15”-18”, weight 7-15 lbs) suit set including jacket, leash, bow tie collar, and accessory bag. 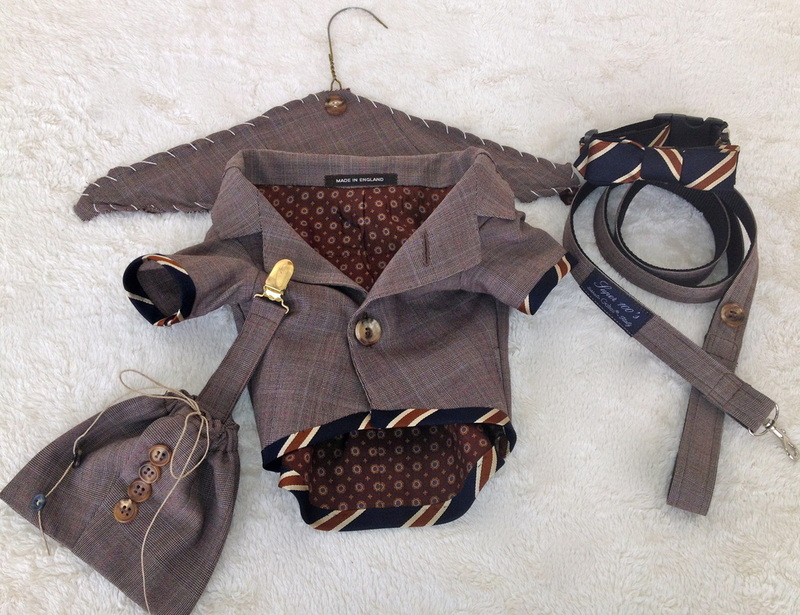 Krizia 100% lightweight wool tan & brown mini HOUNDStooth with 100% imported silk tie from Brussell’s Beverly Hills upcycled into a medium dog (body length 12”-14”, chest 19”-23”, weight 10-31 lbs) suit set including jacket, leash, bow tie collar, and accessory bag. 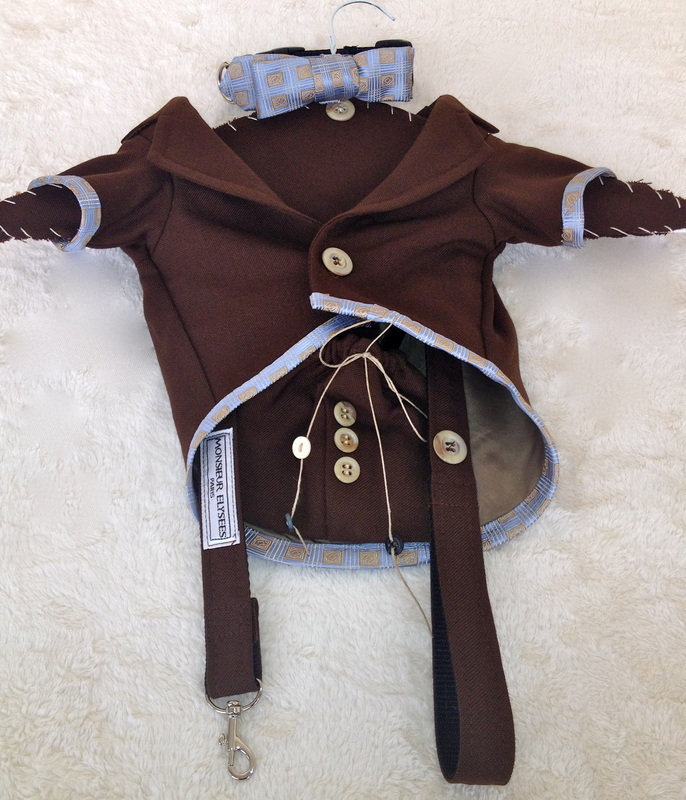 Robertson’s Carmel-By-The-Sea 100% light-weight linen suit in Chocolate brown with 100% imported silk tie from Monsieur Elysees - Paris upcycled into a small dog (body length 8”-14”, chest 15”-18”, weight 7-15 lbs) suit set including jacket, leash, bow tie collar, and accessory bag. 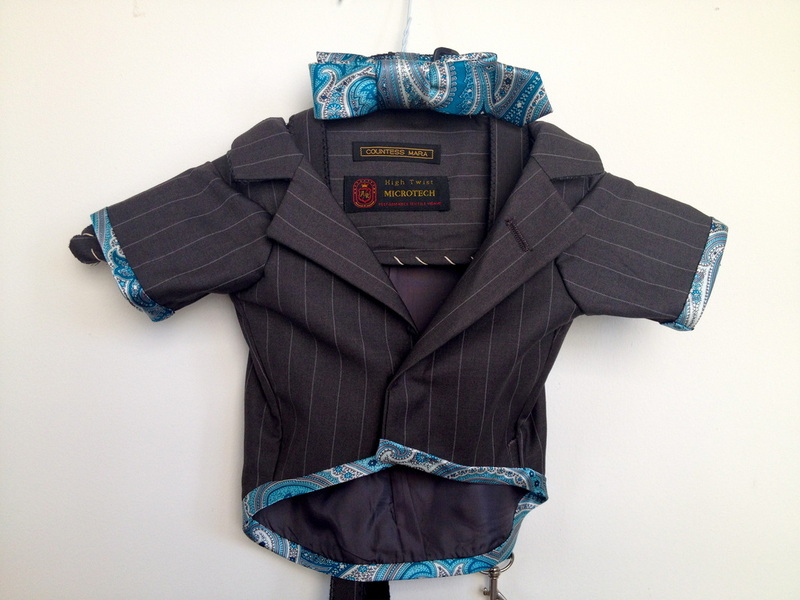 Webb’s of California 100% light-weight wool brown stripe suit with 100% imported silk tie from Cintas upcycled into a small dog (body length 8”-14”, chest 15”-18”, weight 7-15 lbs) suit set including jacket, leash, bow tie collar, and accessory bag.